Every holiday has its own flair and style. That includes for fashion, but nothing says Thanksgiving, well other than Turkey, like pies do. Everyone loves pie at Thanksgiving and in fact, I was hard-pressed to believe my eyes when I found out that Pumpkin Pie isn’t the most eaten pie at Thanksgiving time. Apple pie actually is. Whatever you eat on Thanksgiving though you know you want your own piece of the pie. So why not have some beautiful and creative pie inspired nails? They are all the rage and more Instagram artists are coming up with fabulous pie art for their manicures. Check out these awesome nails and tutorials for your own inspiration. The crisscross crusts and the beautiful fruit aren’t just stunning on a decadent Thanksgiving table, but perfect for your next mani or pedi. Yes, you can get the same cute and very realistic looking pie crisscross on your nails. It’s actually a lot easier than it looks. So here is one of my favorite tutorials on YouTube by Cdbnails. Watch and learn. If you want the whole pie on your nails then you should look no further than the Apple Pie Nails made by happilyeverafter99 on YouTube. She not only gives you a piece of the pie but the whole pie in this awesome tutorial. These nails aren’t as realistic as the other ones as they are more cartoonish, but it’s really cool how she uses a stamping technique to get the pattern on all of her nails. You could use this for a mani or pedi. It’s interesting to watch and even better to try on yourself or your friends. It’s cute and creative for Thanksgiving. So if you want some Apple Pie nails which happen to be the most eaten pie at Thanksgiving then follow her lead. This is one of the easiest pie nail art styles you can do for Thanksgiving. It’s a cherry pie inspired nail art that includes the crisscross pie crust you love with the very trendy 2018 cherries on the nails. These cute little cherries and pie crusts aren’t just fashionable, but they may make you a little hungry every time you look down. So be warned. For these deliciously cute nails check out the tutorial by CloeCouture here. We can’t have Thanksgiving pie nails without a Pumpkin pie tutorial. That would just simply be wrong. Pumpkin Pie may not be the most famous pie to eat on Thanksgiving, but it is second best and that works for us. Look, these acrylic inspired pumpkin pie nails are so decadent you will wish that you were actually eating them at your Thanksgiving feast. These have glitz and glam, but they are also topped with whipped cream. You can’t go wrong with pie and whipped cream. Check out the tutorial here. If you’re into the 3D acrylic look this next tutorial will be for you. This is a Cherry Pie 3D acrylic nail look not only gives you the beautiful crust and cherry pie underneath, but you can literally let people take a piece of your pie nails. There is a removable slice included and it’s not only creative but pretty funny. If you’re into beauty and humor check out this tutorial here. This is another great nail consideration. Apple pie nail stamping that’s done differently than the other stamping tutorial. I find this not only interesting, but the end result is more elegant and less cartoonish than the other stamping tutorial above. So if you’re looking for something a little less cartoon styled and something more elegant, but still fun this tutorial by Yvonne Lopez on YouTube is for you. I love how she got the apples to look. They look beautiful and juicy like something Snow White would chomp into. If you liked the removable Apple pie piece from the other tutorial above, then you will love this look as well. This is a Pumpkin pie with a removable pie piece. I love this pumpkin pie nail art. It looks like a REAL pumpkin pie and even has that cute little dab of whipped cream on top. I have to say I’m obsessed with these nails as much as I love eating the actual pumpkin pie. If you don’t like acrylics but you’re thinking about a pumpkin pie for your next manicure you should check out this amazing tutorial done by Nail Art Tutorial on YouTube. I don’t know how they made this pumpkin pie look so good, but they did. It’s a piece of pumpkin pie painted on each nail. However, I think you’ll agree this is art that could be in a cookbook or a gallery. It’s so well done I haven’t seen anyone pull off a piece of pumpkin pie, that’s not 3D, better. Check out the tutorial here. Of course, no Thanksgiving is complete without Sweet Potato Pie. It’s one of my favorites and it will look even better on your nails. This is a minimalist perspective on sweet potato nail art, but it’s so simple that it’s perfect. Thanksgiving is a simple holiday after all about being thankful and giving thanks to those around you. 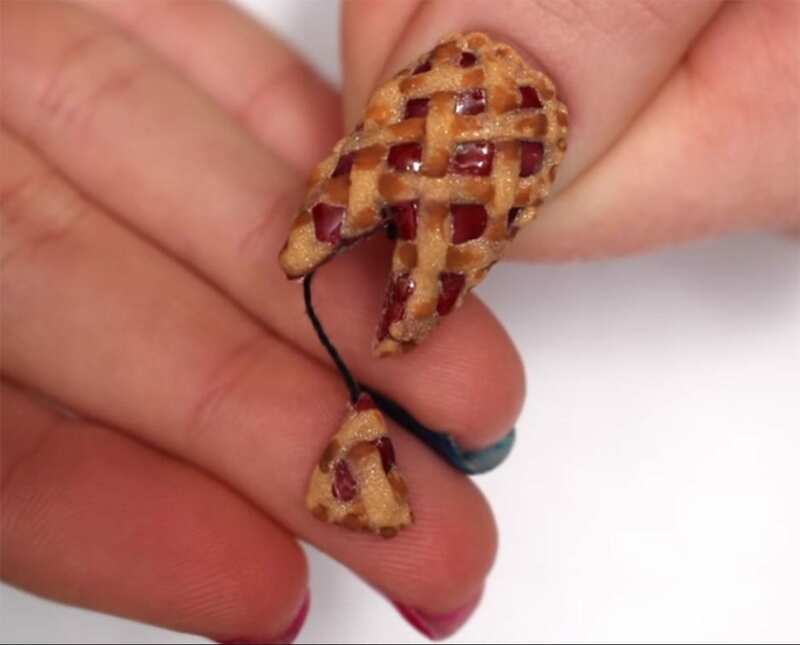 Check out this awesome nail art here by Valencia B.
I hope you’re inspired and enjoy your slice of pie this Thanksgiving!